For the enhancement of the volunteering practices worldwide, the International Forum for Volunteering in Development (Forum) coordinated various Consultation Workshops on Global Volunteering for Development Standard (GVDS), which served as avenue for knowledge sharing among the Forum members and key stakeholders. 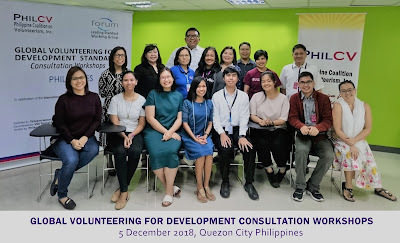 In the Philippines, through the Forum’s Leading Standard Working Group, the Philippine Coalition on Volunteerism (PhilCV) hosted GVDS Workshop on 5 December 2018 in time for the International Volunteer Day 2018 and also the National Volunteer Month (NVM). PhilCV government partner, the Philippine National Volunteer Service Coordinating Agency – PNVSCA also participated the said workshop. The Forum informed that the development of the Global Standard will begin in January 2019 and will be launched at the annual IVCO Conference (International Volunteer Cooperation Organisations) in Rwanda in October 2019.
inﬂuence policy on volunteering for Philippine development.